Stronghold dissects the Superhero and plays with conspiracy theories through an engaging narrative and outstanding art work. One of the best comics currently on the shelf, the creators are giving the reader a masterclass in comic book storytelling. 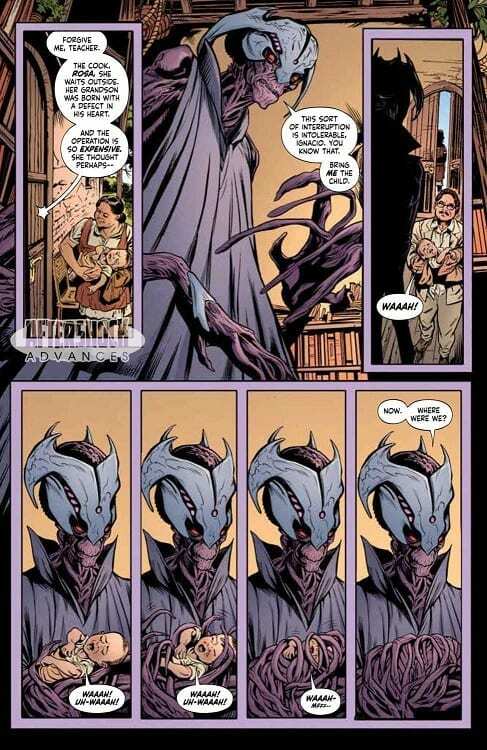 After the magnificent first issue of Stronghold, can Phil Hester and Ryan Kelly continue to impress with their conspiracy heavy Alien invasion story? AfterShock Comics are hoping so. The story continues with a host of characters and a creative team producing some grade A work. Like a Spider at the centre of a Web, the ‘Teacher’ is introduced during the opening of this second issue. From the first page his alien origins are evident but how he relates to the Primacy and the Stronghold is let to be revealed. Giving out instructions relating to a number of heinous acts, the Teacher is evidently searching for something, and he may have just found it. Meanwhile in America, Michael is left wandering, trying to process what happened to him and Claire is preparing for life outside the Stronghold. Hester shifts the focus of this issue away from the two central characters by introducing a more superior villain. He wastes no time in setting up the Alien presence and makes it clear from page one that this creature is behind some of the World’s most horrible acts of violence. However, Hester manages to give the Alien another side, a tenderness to counter the ‘evil creature’ of first impressions. 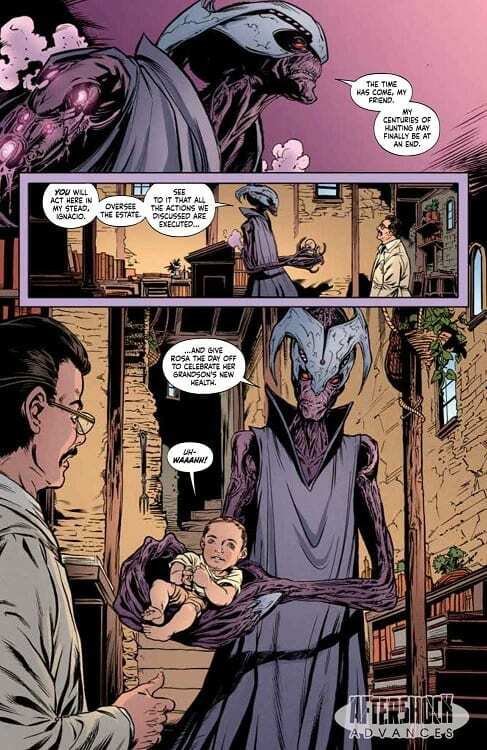 Hester’s ability to make you question the nature of this beast is impressive and illustrates how well he has crafted the characters in Stronghold. All of this tenderness is soon forgotten, however, as the story unfolds. By concentrating on the villainous characters, Hester is able to speed up the pace of the narrative. This makes this issue of Stronghold a much quicker read than last month. However, it is still packed with concepts and parallel storylines, expanding the world for the readers. Ryan Kelly’s art work is extremely detailed with complex figure work. He designs the backgrounds to be more than just settings, they reflect the tone of the narrative at any given point. An empty, almost deserted bus station acts as a symbol for Michael’s mental state just as the screen filled walls of the Stronghold reflect the high tech element of their storyline. Kelly doesn’t use any set grid pattern throughout, chopping and changing to suit the situation. In the same way he alters his frame styles to add impact to certain panels. The use of colored gutters strengthens the settings and are an indicator to the reader whose story line they are reading. If a comic book is a language then Kelly’s layout design is a strong accent that is recognisably his. The colors in Stronghold, provided by Dee Cunniffe, are an emotional backdrop to the narrative. They are especially effective when he moves away from the realistic, varied palate and highlights a specific color. The blood red dream sequence, for example, has more of an impact because it stands out visually from the pages surrounding it. Simon Bowland’s lettering is subtler. Slight inflections or bolding of the text creates emphasis but also gives each page a rhythm for the reader to follow. Everything about Stronghold, from the script to each aspect of the art, is about building a pace for the narrative. It succeeds in drawing the reader in and then drowning them in a diverse world populated by mysteries and violence. The experience of reading this comic is over much quicker than you realise, especially considering how much happens in this issue. There are a lot of concepts and story threads weaving through each other and surprisingly, in this issue, none of those threads actually interact. The success of Stronghold lies with the co-ordination of the creative team, all working together to produce something that flows effortlessly. The narrative gives the reader a lot to digest but the art work makes the consumption really easy. The ending comes almost too soon, but the final shocking splash page will leave you wanting more.